Ashes of Creation MMO Will Have Impressive Dynamic Weather System | Nerd Much? The MMORPG landscape is changing, and as more and more new MMORPGs fail shortly after their release, developers are beginning to make less and less of them. But that’s not stopping Intrepid Studios from continuing to work on their upcoming fantasy MMO, Ashes of Creation. And in its early stages, it certainly looks promising. This evening, the devs over at Intrepid released a short blog detailing a few more details about what to expect from the Ashes of Creation MMO. More specifically, the team has shed some light on their dynamic weather system. We now know that the environments will change “on a regular basis” due to each zone’s seasonal cycle. One of the examples given is that snow could potentially block a certain pathway that would otherwise be accessible in warmer months when there isn’t any snow to block it. What’s more, the warmer weather might entice new creatures to appear in a zone that would be lifeless in the winter. However, dynamic weather has been seen in games before — sure. But Intrepid appears to be taking things a step further with Ashes of Creation, thanks to a unique system that involves the season lengths adjusting based on the world’s Nodes and their progression. It sounds like the devs are still chiseling around in their game to figure out exactly what all that means and what it could mean for players in the world, but in the blog post, they tease things like “what happens if there’s an unexpectedly long summer and a far too short autumn?” Interestingly, the developers want to have the seasonal cycles affect things like NPC generation, boss content, dungeons, drop tables, combat, gatherables, and just about every other facet of the game. The goal is to have players approach gameplay depending on the “mood” of the world. 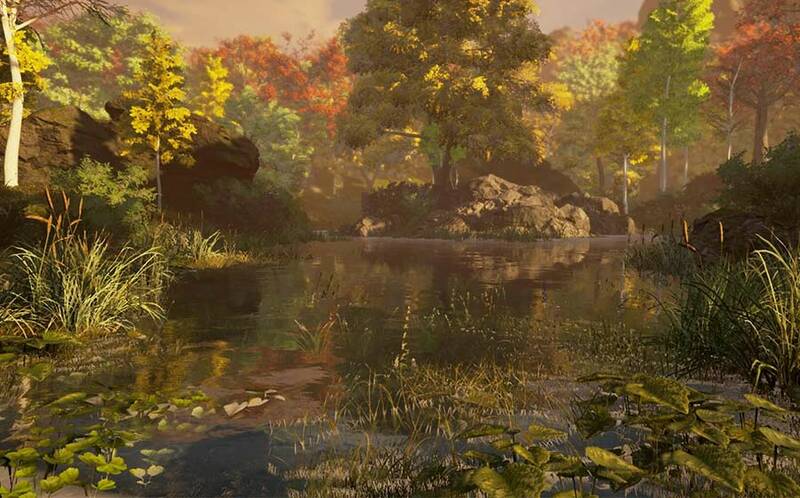 Of course, the studio gave us a first look at the seasons they’re referring to with an impressive development video, showcasing the graphical prowess of Unreal Engine 4 and what their game world has developed into so far. You can check the video out above, and stay tuned to Nerd Much? for more Ashes of Creation news in the future — we’re following this one closely.